This article belongs to the series documenting the reasoning behind and development of new features in the Formal Methods Toolkit. Ghost variables can be very helpful in system verification, as they allow to reason about the program correctness by referring to values that are fully handled by static means, with no need to exist at run-time. As a motivating example, two operations can be bound by the requirement that one has to be called before another one is executed - like engines need to be started before the rocket can be launched, or user input must be validated before it is processed, and so on. It is possible to model such requirements with the use of a dedicated variable (in such cases a single Boolean variable would be sufficient) - for example, the user input validation operation could set that variable to True to indicate that the validation step was done and then the input processing operation could check the same variable to determine whether the data was already validated. In some cases it appears, however, that once such a check is statically verified, the reason for the variable to exist at run-time disappears and it can be handled entirely in the static domain. Such variables are called ghosts. Introducing some basic support for ghost variables is relatively straightforward in FMT, where the verification is performed by solving symbolic equations where symbols are generated to reflect actual variables used in the model, including all supporting statements from pre- and post-conditions. From this perspective, a ghost variable is just another symbol that can be used in verification statements without any special treatment, except for the need to inform the solver about the intended domain of the variable. Since the solver at the lower level operates on Integers and Booleans domains only (user-defined types are ultimately mapped to them, with range constraints and type invariants added to the set of expressions), these are the most natural choices for ghosts as well. 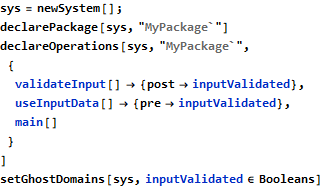 The above states that someGhostVariable belongs to the Booleans domain and this is remembered within the model sys, so that further uses of that variable do not need to be obscured with the same information anymore - this is conceptually similar to declaring a regular variable in the model. For convenience, this function will accept both single or multiple (listed) domain associations. There are three operations in this model, with validateInput and useInputData being related in the way that validateInput promises to set the inputValidated variable and useInputData expects that variable to be already True when it is invoked. The above output means that from two steps within the main operation, the first (which is a call to validateInput) establishes that inputValidated is True, which is exactly what the second step (which is a call to useInputData) expects as its pre-condition. In other words, the requirement to always have the input validated before it is used was verified with the use of some artificial variable that does not need to exist in the model as a run-time value. As far as the solver is concerned, the above is equivalent to setting inputValidated to True. This approach might look slippery as the Assume construct has the ability to inject arbitrary knowledge, including the wrong one, and is therefore considered dangerous - but in this context it is not any more dangerous than imperative assignment to some arbitrary state variable and it might actually be more appropriate as it better attracts attention during reviews. Again, removing the call to rightEngineStart from main causes the verification to fail. 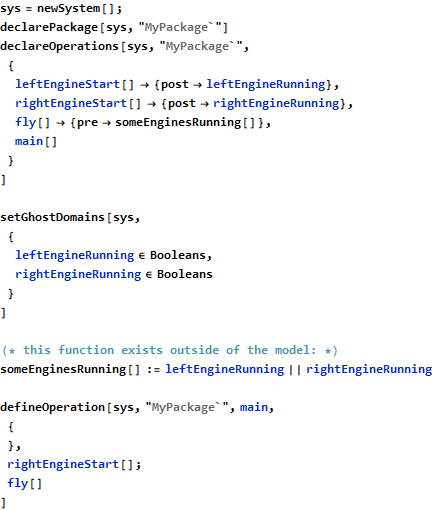 The ghost symbols leftEngineRunning, rightEngineRunning and someEnginesRunning never make it to the generated source code, because even though they are used to reason about the model, they are not part of it. This basic support for ghost variables has a natural limitation that only simple Integers and Booleans values are allowed - that is, no ghost arrays or structures are possible. This limitation comes from the fact that ghost variables are decoupled from the model and are not handled by the main grammar and expression processing engine. On the other hand (and for the same reason), they are not constrained by the FMT grammar and therefore can be manipulated in ways that are potentially much more expressive and powerful. The setGhostDomains function and the relaxed grammar rules for Assert and Assume will be available in FMT 2.0.